alaTest hat 460 Testberichte und Kundenbewertungen für Binatone Luna 1105 zusammengefasst und analysiert. Im Durchschnitt wurde das Produkt mit 4.3/5 bewertet, verglichen mit einer durchschnittlichen Bewertung von 4.0/5 für andere Produkte in der Kategorie Schnurlose Telefone. Wir haben sowohl Nutzer- als auch Expertenbewertungen, Produktalter und weitere Faktoren ausgewertet. Im Vergleich zu anderen Produkte in der Kategorie Schnurlose Telefone erzielt Binatone Luna 1105 einen alaScore™ von 89/100 = Sehr gut. 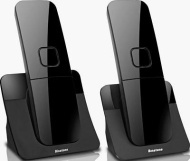 The Binatone Luna 1105 is a cheap cordless home phone. It's a pretty simple device and lacks an answerphone, but does it get the basics - such as call quality - right? We sent this cordless phone to our lab to find out.
" Brilliant, easy to set up and use :) "
" So pleased I made this purchase its the best landline phone I've bought. Easy to use, all the features are great. " " The phones look great, don't take up much room and are very easy to use. Definitely recommend them :-) "
" Excellent ring tone good size phone and good value for money. " " Great phone easy to use and great features "
" Bought these for my elderly mother she likes them so easy to set up and use and she loves the hands free function "
" The phones are easy to work and the buttons are a good size ,they took smart to,and the ring tones are lovely. " " Great looking. Good purchase. " " Good landline. Quite basic but with good look and functionality "